This month we shine the spotlight on Pat Swancutt. He is a Physical Therapist and Athletic Trainer at our Coralville clinic. 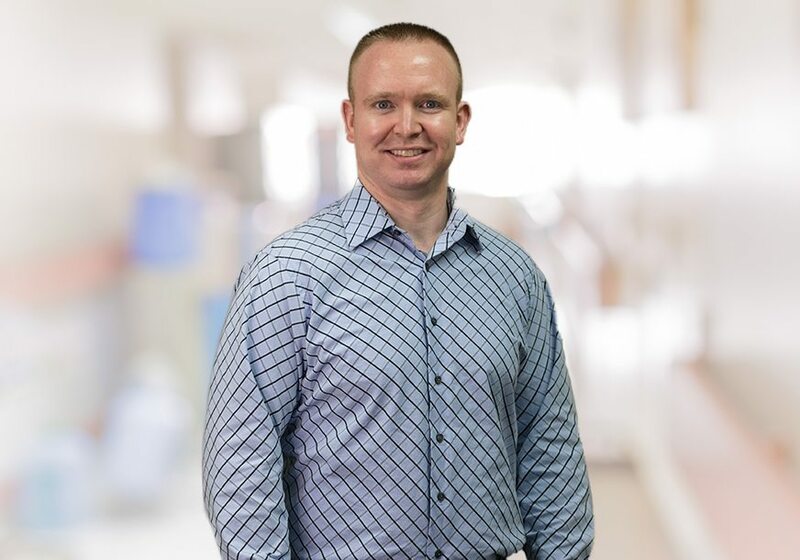 Pat’s primary interests include outpatient orthopedics and sports medicine, post-operative rehabilitation, and providing outreach athletic training and strength and conditioning services to area high schools. Pat integrates the latest in manual therapy techniques and evidenced-based exercise progressions to achieve the best possible outcomes in his patients. In his free time, Pat enjoys cheering on the Hawkeyes, bow hunting, fishing, and spending time with his family. Last big purchase: Our last big purchase was when we finally broke down and became a minivan family. With three kids in car seats it became a must, and I have to admit that it hasn’t been that bad. Last family vacation: Our last family vacation was this past June when we went to Mille Lacs Lake in Minnesota with my wife’s side of the family. We spent a week fishing and hanging out in cabins next to the lake. Fishing takes on a whole different meaning when you’re on a boat with 10 kids under 10 years old! Favorite memory from last year: My favorite memory from last year was probably the day that my daughter started pre-school. She’s the oldest of my children and it has been so much fun watching them gorw up. Seeing her excitement for starting school was awesome. Move that left a lasting impression: I love movies, but most of the movies I enjoy are either comedies or action films so it is difficult to think of a movie that left a lasting impression. The movie Foxcatcher describes the life and death of Olympic wrestler Dave Shultz. I grew up around the sport of wrestling and was aware of the events surrounding his untimely death, but as the movie came out many stories were shared regarding personal experience with the Foxcather facility and Shultz family from people still very active in the sport today. It made the entire experience of watching the movie a lot more impactful than just watching a good film. Last sport I played: The last sport I plated can be answered different way depending on the definition of sport. The sports that I am most active with are hunting and fishing right now. as far as sports where you keep score, it would probably be golf, but with three active kids it’s been a few years since I’ve been able to hit the links. One of the things patients talk to us about during physical therapy visits is how they know that they aren’t very flexible. The way they typically bring this up is as if they are pointing out a statement of fact about something that isn’t changeable, like they know they are only 5 feet tall or that they were born with an extra kidney. Under most circumstances, however, having poor flexibility is not a life-long condition unless you allow it to be. While it’s true that some people are predisposed to being more or less flexible ​than others, those of us that find ourselves feeling more on the tight side of the scale can usually see progress by putting in some consistent effort. The frustrating part with becoming more flexible is that it doesn’t happen overnight. The mistake most people make with stretching is that they put too much tension on the muscle, and they don’t hold it long enough or repeat that stretch consistently over time. Muscle is very elastic tissue. If you take and stretch a rubber band out but then immediately let it go, it will quickly return to its original size. On the other hand, if you take that same rubber band and wrap it around something very large and leave it for a long time, the rubber band will have increased its length. Muscle works in a similar way. If you are stretching and feel an extreme amount of tension, but you are only holding for a 3-second count, you are very unlikely to see a measurable change in your flexibility over time. However, if you start to apply a stretch and can hold that initial stretch for a longer period of time (30-60 seconds,) you will have much greater success in stretching that tissue. You will also have a much smaller likelihood of injuring yourself. Now, as I said earlier, the key to gaining flexibility over time is to repeat that same low intensity, long duration hold on a daily basis for a long enough period for you to notice a change. If you are really tight and need to make a significant change, I usually recommend people start with holds of 10-15 seconds and then gradually work up to the longer holds. If you are holding for a longer period of time, you can get by with only doing 1-2 repetitions of each stretch. As you are gaining flexibility, I typically recommend trying to stretch at least 2-3 times per day. Once you’ve reached your goal for flexibility, you may be able to reduce that to once per day or every other day, depending on your body. If you experience any pain or feel like no matter how much you stretch it just doesn’t improve, schedule an appointment with one of our physical therapists for an evaluation.